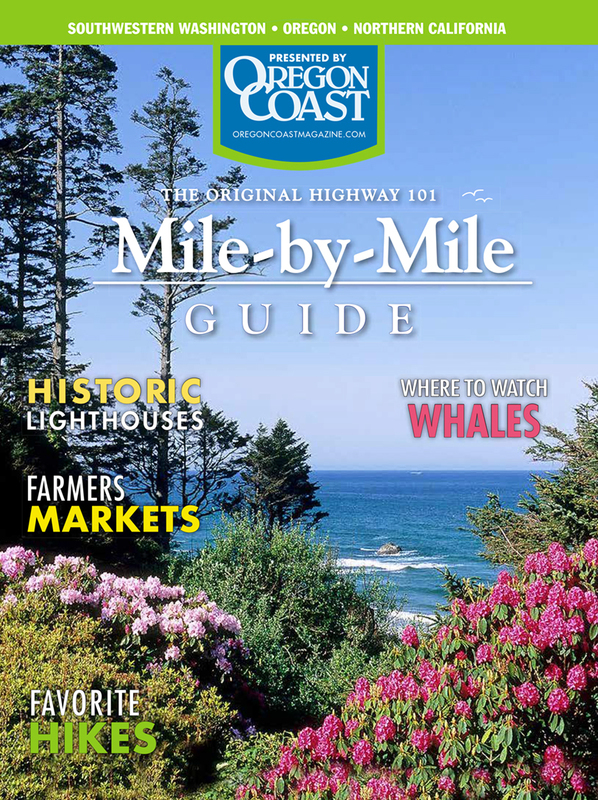 The story of sand along the Oregon Coast includes Ice Age floods, shifting dunes, and wartime super-sleuths. Kids are coated with it after a day at the Oregon Coast, and so is every inch of the family dog. Adults get it in their shoes, and picnic sandwiches have their share of it, too. We lie on it, dig in it, and run our fingers and toes through it. Sand is humble and familiar, and most of us don’t have any idea what a remarkable substance it is. Millions upon millions of grains of sand fit into one cubic foot–and each individual particle is the product of a series of events stretching back in time—in some instances, farther than we can begin to imagine. Oregon beach sand is generally a mix of ground-up rocks and minerals, some of it deposited by creeks and rivers that run into the Pacific Ocean. During the “Missoula Floods” 13,000 to 15,000 years ago, fractured ice dams in Montana released massive amounts water, ice, and rock into Oregon. According to the Geological Society of America, the enormously swollen Columbia River deposited material all the way to the ocean. 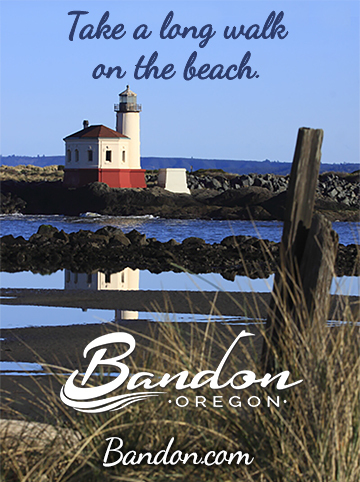 This means that on Oregon’s northern beaches, the sand under your feet may contain particles of boulders that were transported from hundreds of miles to the east. Glittering specks of sand are often silica from quartz, the same mineral that’s used to make glass. Carbonates—the grain-sized remains of sea life—as well as larger bits of bones and shells are most typical of tropical beaches. The variations are endless, but it’s possible to analyze the composition and shape of sand particles for clues to their origins, and whether they were deposited by water or by some other process. 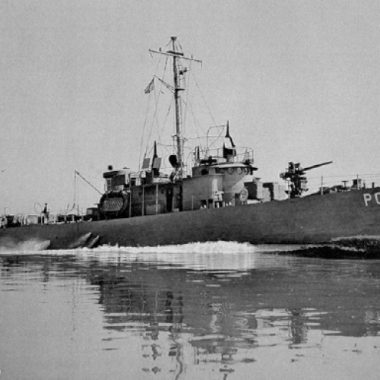 During World War II, American geologists put these facts to use in a surprising way. 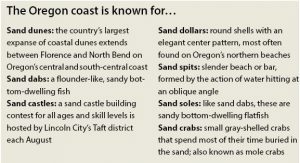 Incredible as it sounds, the analysis of sand played a key role in halting an attack on Oregon and other western states. Late in the war, Japan launched thousands of airborne incendiary bombs into the newly-discovered jet stream passing high over the Pacific Ocean to North America. The goal was to ignite a huge swath of forest fires that would create panic and divert personnel and funds away from the war effort. Geologists located the “balloon bomb” production site through a creative piece of detective work: after learning that Japan used sand for balloon ballast, they devised an analysis of the sand’s origin. It turned out that the site of origin was on Japan’s main island, and that the airborne bombs were launched from Japan, not from submarines off the West Coast of the United States as had been previously thought. American bombers succeeded in halting production of the weapons by destroying two of the three factories manufacturing hydrogen for the balloons. The Smithsonian Annals of Flight: Japan’s World War II Balloon Bomb Attacks on North America is one of several published accounts of the unusual role that sand played in ending this campaign. 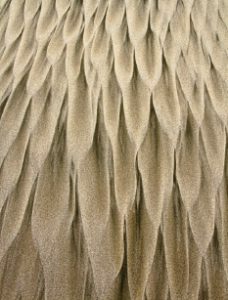 Just as each grain of sand has a history, sand dunes have histories too. 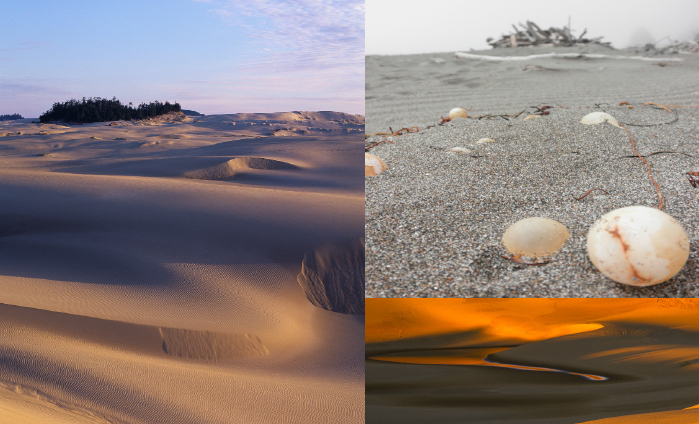 Dunes along Oregon’s central and south-central coast are formed by the actions of wind and water, but they are also affected by human activities, both modern and ancient. Sand dunes around Tahkenitch Lake, south of Florence, are a good example. Tahkenitch Lake was a Native American habitation and food-gathering place for many hundreds of years, according to the Bureau of Land Management’s Archeology of Oregon. 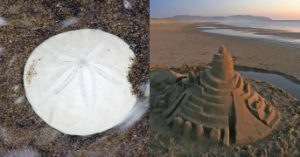 These activities left their mark on the dunes, but at the same time, it appears that the dunes also impacted the lives of ancient inhabitants. For instance, archeologists suggest that shifting sand can block the outlet of a lake, causing a reduction in the number of marine species that are available to be eaten—a form of sand-related environmental change that affected people’s lives long ago.